When Vince Clarke left Depeche Mode, he had a brief period of working with various other artists. His first project was Yazoo, together with Alison Moyet, and then in 1983 he got together with Feargal Sharkey to record a single as The Asssembly. 'Never never' featured a sampled guitar track, triggered note for note on a Fairlight CMI. 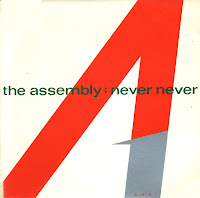 Vince Clarke and producer Daniel Radcliffe had planned to record more tracks as The Assembly, using a different singer on each track, but none were released after 'Never never'. This one single was a big success nevertheless, reaching number 4 in the UK singles chart.